A $2.5 million gift from two University of Wyoming alumni who are staunch supporters of UW Libraries will create two programs: a campus reading program and a librarian position to work closely with the UW Honors College. UW Reads aims to broaden the shared understanding of the world through the joys of a good book, and the Endowed Librarian for Academic Excellence position will serve as a liaison between the Honors College and UW Libraries, as well as overseeing the UW Reads program. The gift will be closely aligned with the McMurry-Spieles Library Excellence Endowment, which already supports the UW Libraries scholarship and professional development of librarians and library staff; the McMurry-Spieles Outstanding Staff Award; the McMurry-Spieles Research Collection; the Alma Doke McMurry Reading Room; Popular Reading Collection; and the McMurry-Spieles Author Series. Inspiring conversation and discovery, the UW Reads program is modeled on the Big Read, a program of the National Endowment for the Arts that supports dynamic reading communities across the nation. It’s based on the principle that larger conversations about shared ideas can transform communities. Once the program is established, a book would be selected from a range of contemporary titles that reflect many different voices and perspectives, which participants sign up to read. Based on the book, the program may include activities such as readers joining book discussions online or in person. Speakers, including the author of the book or subject matter experts, may be invited to visit campus. Panel discussions, film screenings and public readings also may be offered, and the number and type of events will evolve from year to year. The UW Reads program furthers the UW strategic plan and the UW Libraries strategic plan by promoting and strengthening the university as a scholarly and creative enterprise. 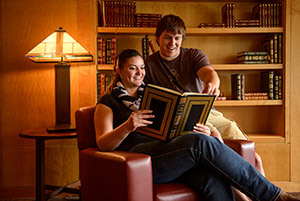 It more closely connects UW Libraries with the Honors College and connects students with prominent authors and thought leaders. UW Reads appeals to adult readers and the general public, and it could contribute to public perspectives on diversity and inclusion. It aims to enhance UW’s relationship with the state and help build a statewide community of learners. The Endowed Librarian for Academic Excellence position will support the mission and programming of UW’s newly established Honors College, as well as scholarship and student excellence in general. This person will serve as a liaison between the Honors College and UW Libraries, as well as the main point of contact for Honors College students and faculty for library services and resources. He or she also will promote collaborations with the Wyoming State Library, community college libraries and statewide public libraries. The position also will teach colloquia in the Honors College; develop open educational resources for the Honors College in the libraries; and serve as a critical point person for students seeking essential library resources for their theses. The position will create exhibits and offer lectures and specialized workshops on library research or digital scholarship. He or she will assist with educational and research experiences at the American Heritage Center and will oversee undergraduate research awards. An Honors Program began at UW in 1959, and the Honors Program became the Honors College in 2017, part of Nichols’ strategic plan, “Breaking Through: 2017-2022.” Skinner is an accomplished biologist, teacher and administrator, most recently of the Department of Zoology and Physiology. Honors scholars are intellectually curious students from all majors who are creative, inspired by diverse ideas and seek a greater understanding of their place in society. The college’s programs include first-year experiences, writing-intensive courses, undergraduate research, service learning, internships and capstone projects. The demand of excellence placed on these students and faculty makes the position of Endowed Librarian for Academic Excellence that much more important. UW alumni Spieles and McMurry are former Wyoming residents who live in Loveland, Colo.
McMurry worked at Coe Library as a student and continued on after she graduated. She also worked for 10 years as a librarian at the UW Family Medicine Residency Clinic in Cheyenne. Spieles graduated from UW with bachelor’s and master’s degrees in microbiology, and McMurry graduated with a bachelor’s degree in English, all in the 1960s. For his career, Spieles worked in pharmaceutical research and mining. Following her passion, McMurry was a medical librarian. Spieles and McMurry have served on the UW Libraries Development Board, and Spieles was a longtime board member of the UW Foundation. Both value the time they spent at UW and the friends they made, and Spieles rarely misses a Pokes game. Philanthropy plays a big part in Spieles’ and McMurry’s lives. The couple has supported the university extensively, including UW Libraries; the UW Art Museum; the colleges of Engineering and Applied Science, Business, and Agriculture and Natural Resources; the UW golf programs; the American Heritage Center; and the UW Foundation. Their gift, in support of the Alma Doke McMurry Reading Room, honors McMurry’s grandmother. They say that giving back to the community is a family value instilled by both sets of their parents, Earl and Irene Spieles, and Neil and Ellie McMurry. They donate to other Wyoming and Colorado charities as well.